ArteMea works with designers, restaurant and hotel managing directors, and business owners to curate a variety of different spaces based on purpose and clientele - we will source the ideal collection of design elements and artworks for you. This service can be tailored to the project manager's and/or owner's liking. From traditional offices with white walls to hip and modern boutiques hotels, we curate all areas with an immaculate attention to detail taking into account the architecture and design of the room itself to make sure every artwork, sculpture, lighting, and design element achieves the intended ambience and character. In his new body of work, Atmosphere, Regalo explores the seemingly vast ‘empty’ space around us and suggests that there may be more than meets the eye. Referencing nature – forests, mountains, reflections on water and light – the collection features 5 original paintings on raw canvas including a 6-meter long installation inspired by the River Thames. Shock London is an alternative curated presentation by Steven Payne - Maison AD and Laura Pivetta - ArteMea Advisory, of rare works by London based artists and furniture makers from Paris. Endless presents his timeless CHAPEL artwork on the walls of the landmark Oxo Tower Brasserie. 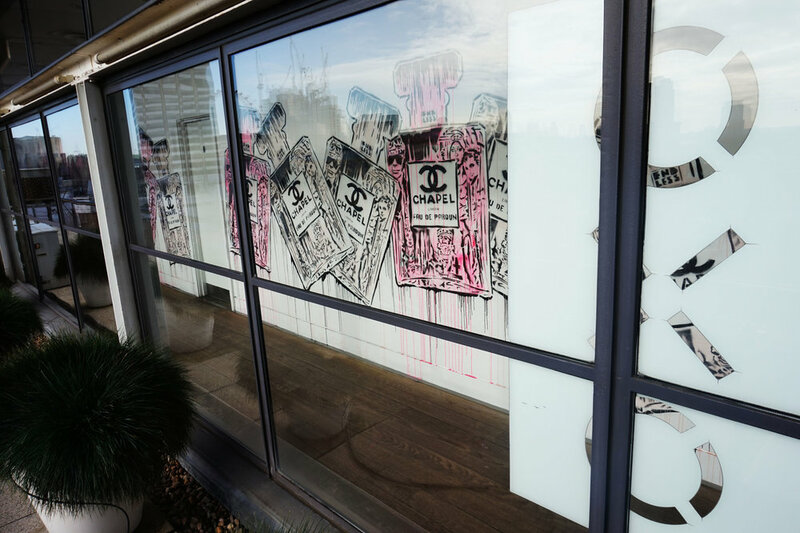 The artwork is his own take on the iconic Chanel No5 perfume, which rose to success through revolutionary marketing tactics employed by Coco Chanel in the early 1920s. Such tactics paved the way for the brand-obsessed culture in which we live today. The name change on the Endless bottle represents this culture shift in one word, ‘Chapel’ – a world where brands are the new deities; shops are the new churches, and celebrities, marketers and advertisers play the part of god. The gods in this piece include Karl Lagerfeld, Kate Moss and Naomi Campbell. Oxo Tower Wharf is an award-winning, landmark building situated on the riverside walkway part of London’s fast moving South Bank and Bankside areas. Since its conception in the 1930s, Oxo Tower Wharf is home to some of the UK’s most innovative and internationally renowned contemporary designers, restaurants, cafes, bars and exhibition venues. 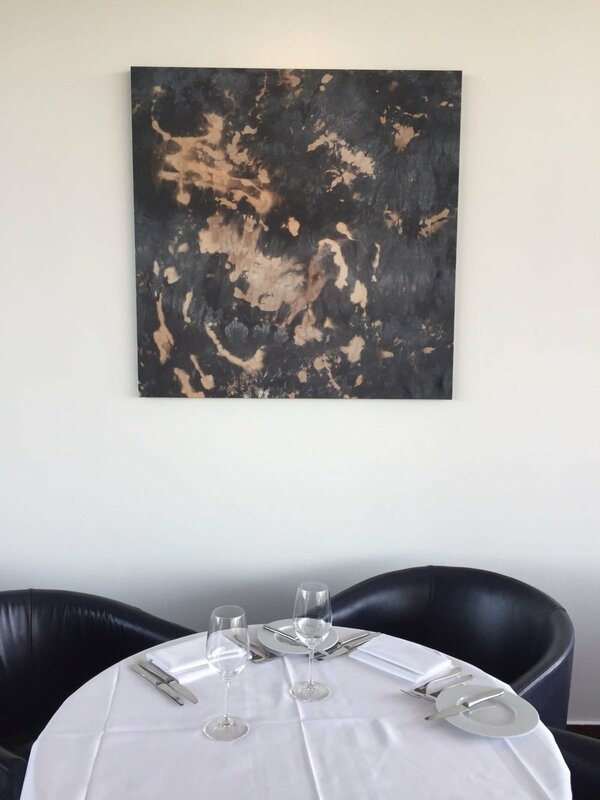 ArteMea is excited to announce that Dd Regalo is exhibiting 9 new paintings in the world-renowed OXO Restaurant located on the 8th Floor with stunning Central London views. This collection of nine abstract paintings by Canadian artist Dd Regalo is inspired by the movement and intensity of coastal landscapes and creates a vivid contrast to the cityscape surrounding OXO. For further information about the works and commissions or arrange viewing, please email laura@artemeaadvisory.com. OXO Tower Brasserie and ArteMea Advisory have come together to present an exciting collection of prints and stencils by Grimsby-born fine artist Paul Robinson. Unlike anything that has graced the walls of OXO before, Paul’s Ingenuity, ability and passion can be seen through this striking exhibition. Paul’s work includes large-scale oil on canvas, photographs, limited edition prints, wall sculptures and murals such as The Pink Spectrum - seven stencilled pink bears, one for each colour of the rainbow. For further information about the works and commissions, please email laura@artemeaadvisory.com. Commissioned project, 90 framed individual artworks. The brief was to capture the many facets of New York in the context of a classic New York deli. Our team is busy working on some amazing projects.